1. Digital Content Marketing Strategy – We know that Google and other search engines want to deliver the best quality content to their users. Top manufacturers recognize the need to produce the content “goods.” But creating top notch content doesn’t just happen; it requires a strategy, and it takes time. Blogs, white papers, and infographics are great ways for manufacturing brands to provide informative content. But it also helps to expand your portfolio of digital assets when considering a content strategy. Think about the results pages you see when performing a search. Often they include images, instant answers, news and local information. Ensuring your company’s visual assets and business information are optimized for search engines helps your content reach users. Now, think about the reason you perform searches. Usually there is intent involved: the need to answer a question. For example, the first time I had to board my dog while I was traveling, I couldn’t figure out how to disassemble his crate. Instead of struggling, I turned to Google and searched “disassembling my dog crate.” There was a helpful video in position one in the search results. From a man, documenting the process for his father. The video answered my question, but I was surprised that the top result wasn’t from a crate manufacturer. What a wasted opportunity! I’m sure I’m not the only person who has struggled with breaking down a crate, and it seemed like an oversight. Imagine the boost in traffic and engagement the manufacturer could have received if they had spent three minutes filming the disassembly process like this man and his children did for their “pap-aw.” As of today, there are 98,000+ views on this video. A little bit of content strategy can go a long way. 2. Informative Online Webinars – A live digital webinar is a great manufacturing marketing tool for two reasons. First, you have the opportunity to share your organization’s expertise and products with a targeted audience. In certain webinar platforms you will be able to engage with attendees through chat features. The ability to instantly address questions or concerns could mean the difference in a signed contract or sold product. Second, you can collect the attendees’ email addresses at registration to help bolster personalized email campaigns in the future (bonus!). 3. 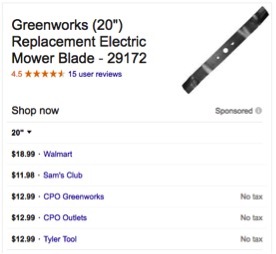 Paid search ecommerce campaigns – If you’re looking for a quick way to boost sales of products or replacement parts, consider Google shopping ads. These paid listings can launch your manufacturing site to the top of the results page, where click through rates are the highest. When users enter a search term, Google will review the (hopefully) optimized product feed in your merchant center and display your related products. Learn more about manufacturing marketing services at Elliance.